Another Reason Why GP wins the ERP war! I have read a lot and heard a lot recently about NetSuite as a competitor to GP. I called with a friend of mine who I know was a Netsuite user to see how things were going - only to learn 'we hope to change out to an on premise application early next year'. I asked more questions and did a little research online and it seems to me the success of an ERP, at this point in time, has nothing to do with Online/Offline. Yes in the small end of the small business market - an online version of MYOB, QuickBooks or Microsoft Accounting would be useful. The reason is this market needs simple, cheap and rigid. The biggest problem facing all ERP vendors is the quality and profitability of the partner Channel. This is something that the GP world has in abundance. Microsoft have great partners. Microsoft is pleased to introduce Business Ready Flexible Pay for Microsoft Dynamics. This offering reduces your customer’s upfront investment through predictable and affordable annual payments which can help optimize their cash flow and improve IT budget management. Microsoft is listening to customers and is actively enabling them to preserve capital resources while making strategic investments in their future. Implementing Microsoft Dynamics and taking advantage of their Business Ready Enhancement Plan helps customers increase their productivity and maximize their return on investment. Check out the new Microsoft Dynamics GP Extending the Reach landing page! BI strategy update strengthens commitment to providing world class financial reporting and planning solutions for customers. For those of you who did not attend Convergence 2009 and have been asking about release dates of service packs and new versions of Dynamics GP, the following shows the anticipated product roadmap. Keep in mind that release dates and product features may change on a dime and by no means can be considered absolute Microsoft commitments. 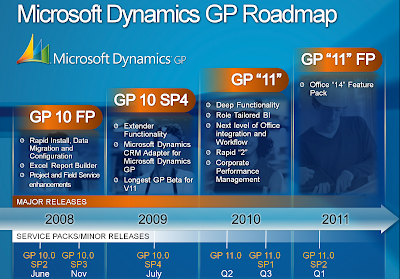 Back in April I published an article describing Microsoft Dynamics GP roadmap up to release GP 11 Future Pack. The timeline also described what would happen at least up to 2011. Just recently the Microsoft Dynamics GP Product Management and Marketing team released a new stub titled Microsoft Dynamics GP "11" Preview with a link to the Dynamics GP "11" Presentation Pack (visit their site for more info). The presentation pack contained a Microsoft Office PowerPoint presentation describing the Dynamics GP roadmap up to GP "14". NEW Extending the Reach resources available! It’s been some time now since we launched our concept of Extending the Reach, which is our initiative for telling customers how they can benefit by leveraging the powerful Microsoft Office SharePoint platform along with Microsoft Office and Dynamics GP. Increased access to information and insight, enhanced collaboration both inside and outside the organization, and removing manual business processes are just some of the benefits our customers realize when leveraging these products together. I am sure many of you are already aware of the forums out there, both those sponsored by Microsoft, and those that are independent (e.g., Experts Exchange, Egghead Cafe, etc). But I thought I would send out a reminder of the partner-specific resources available to Dynamics partners. Check out the links on https://mbs.microsoft.com/partnersource/resources/discussions/.